World War II novels typically focus on Europe. Few look at the anti-Semitism that existed in other parts of the world at the time. 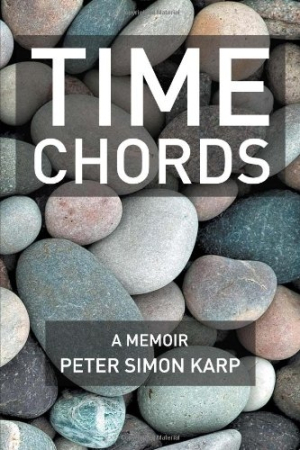 Peter Simon Karp’s fictionalized memoir, Time Chords, is an exception. The protagonist of Karp’s keenly felt book is Joseph, a young Jewish boy living in upstate New York during World War II. Joseph has heard about the Nazis and becomes preoccupied with them. His fear is not unfounded, as he grows to realize that even rural New York is not safe from the Nazis. In one nerve-wracking scene, members of an American Nazi organization appear at his grandfather’s farm as part of a campaign to terrorize Jews. The rest of the narrative traces two seminal events in Joseph’s life: A vicious beating by his classmates, and an outing on a lake that begins in fun and ends in tragedy. Karp has done an excellent job portraying the dynamics of anti-Semitism in a “safe” part of the world during the war. In the lake scene, for example, while Joseph and his friends are playing, another boy asks, “‘They’re religious, aren’t they, wearing those black skull caps? Are they –?’” “‘Yep, their father’s a rabbi,’” Joseph answers. The inference is not lost on the reader. In this passage and others like it, Karp deftly tracks the close relationship between fear, hatred, and powerlessness. There are, however, a few problems with the book. For one, Joseph is not fully developed. His sometimes histrionic reactions undermine his believability. When Joseph’s classmates throw stones at him, he wonders, “Is their hatred driven further by the recent outbreak of anti-Semitism toward Jews, from the ancient pyres of the Spanish Inquisition to today’s burning crosses…to Nazi youth hunting down and attacking young Jews…across Europe?” Though his classmates’ actions are cruel, Joseph’s response is more like that of an adult than a child. Another problem is that Karp’s prose is weighed down by long passages, usually of Joseph’s thoughts, in italics. In one instance, Karp takes the reader out of the moment by suddenly jumping forward in time, presenting a brief summary of the rest of Joseph’s life. While the italicized passages can be eloquent, they jar the reader out of the moment. Another problem is that the story is told in the present tense, which makes the timeline of events confusing. The cover design lacks polish, and the author’s biography on the back cover is missing words. Labeled as both fiction and memoir, it is unclear which parts of the book reflect Karp’s experiences and which are fictionalized. Karp writes that the “core events in these stories are true, seen from the interior of a young boy’s mind and flashed back through the dark lens of an old man’s remembrances.” This double categorization is confusing, and it prevents the reader from becoming fully engaged in the story. Nevertheless, Time Chords takes a unique and important view of World War II-era America.